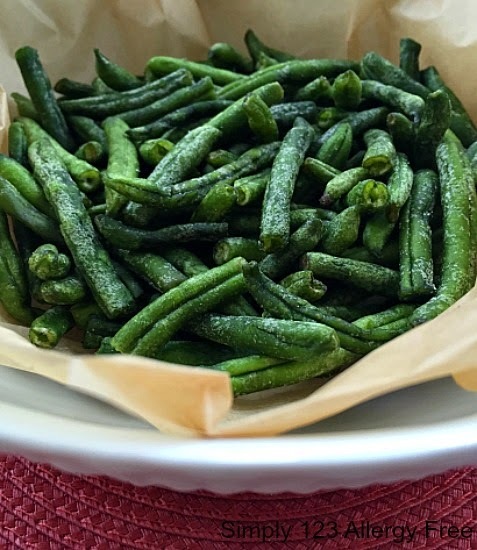 SIMPLY 123 ALLERGY FREE: Oven Baked Crispy Green Beans....Healthy GF Snack!! 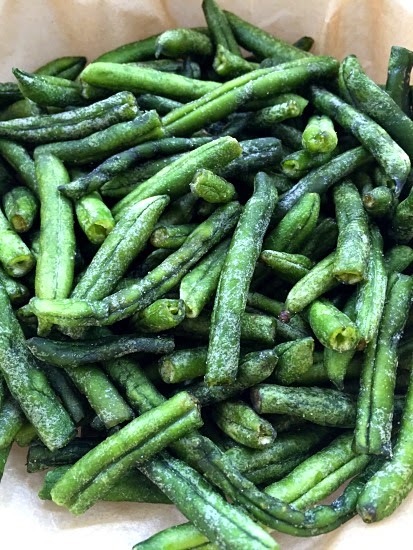 Oven Baked Crispy Green Beans....Healthy GF Snack!! They are easy to whip up, satisfying, and not at all bad for you; as a matter of fact they are actually good for you. I am talking about "Crispy Baked Green Beans.... a Healthy Snack (GF/DF)". They provide all the fun of regular fries, but none of the calories and fat! Although my kids do not generally care for green beans, this recipe had them not only enjoying them, but reaching for seconds. Just like French Fries, you cannot eat just one! In a large bowl, toss the green beans with the olive oil. Add the salt, pepper and paprika and toss well to coat. Pour the green beans onto the baking sheet and bake until crisp, 10 to 15 minutes. Cool slightly before serving. These sound so good! They remind me of those expensive green bean chips. Thanks Jessica and thank you for visiting my site! Thanks Mitzi and I hope your son loves these as much as my kids do! These green beans do sound super good!! Must try! Thanks Bethany and thanks for stopping by! I'm going to have to try this. If they don't get eaten up right away, do they stay crispy or do they soften up a bit? They will stay crispy if there is not too much oil. Thanks for stopping by! Thanks April and thanks for hosting Hearth and Soul Hop! This sounds great - crisp green beans. A great way to get kids to eat their greens and so easy to do. Thanks for sharing on Real Food Fridays. Pinned & twitted. Thanks Marla and thank you for hosting Real Food Friday's! I love green beans and what a twist to making them. My kids might even like them. I think they will! Enjoy and thanks for stopping by! I will sure have to try these Green Beans, they look great! Hope you are having a great week and thanks so much for sharing your awesome talent with Full Plate Thursday. Thank you Miz helen and thanks for hosting Full Plate Thursday! my beans never got crispy even after being in the oven for 25 minutes but...they were delicious. do you leave the leftovers out or refrigerate them?? maybe I use too much olive oil because they're just very shiny and they still have a crunch but they're not dried out with the kosher salt like urs looked. I leave them out of the refrigerator in an air tight container. I think you may have used a touch too much oil but glad you enjoyed them just the same! the beans never go crispy. You may have used a little too much oil which would explains the green beans never crisping up. Hope that helps.